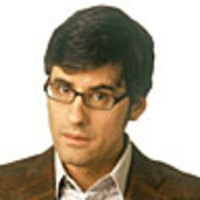 Mo Rocca is a writer, comedian, and political satirist. Rocca is a regular panelist on NPR's Wait Wait...Don't Tell Me! and a regular contributor to CBS' Sunday Morning with Charles Osgood. He is a regular correspondent for NBC's Tonight Show, most recently providing 2008 election coverage, as well as for MSNBC's Countdown with Keith Olbermann. He was a regular contributor to The Daily Show with Jon Stewart from 1998 to 2003.